Mordechai ben Nissan (the Elder). Notitia Karaeorum ex Mardochaei. First Edition. Hebrew and Latin on parallel columns. Translated into Latin by Johann Christoph Wolf. pp. (6), 18, 317, (19). Ex-library, dampstained. Contemporary vellum, rubbed. 4to. Vinograd, Hamburg 63. Hamburg & Leipzig : Christian Liebezeit, 1714. This work, entitled in Hebrew “Dod Mordechai,” was penned by the Karaite scholar Mordecai ben Nissan as a response to a series of queries posed by Leiden professor of Semitics, Jacob Trigland, who sought information concerning the schism between the Rabbanites and the Karaites. Mordecai here discusses the historical development of the Karaites, dating the emergence of the sect to at least during the Second Commonwealth and dividing Karaite history into three periods: its formative years, open rebellion against the Pharisees and finally, the decline of the sect’s popularity. 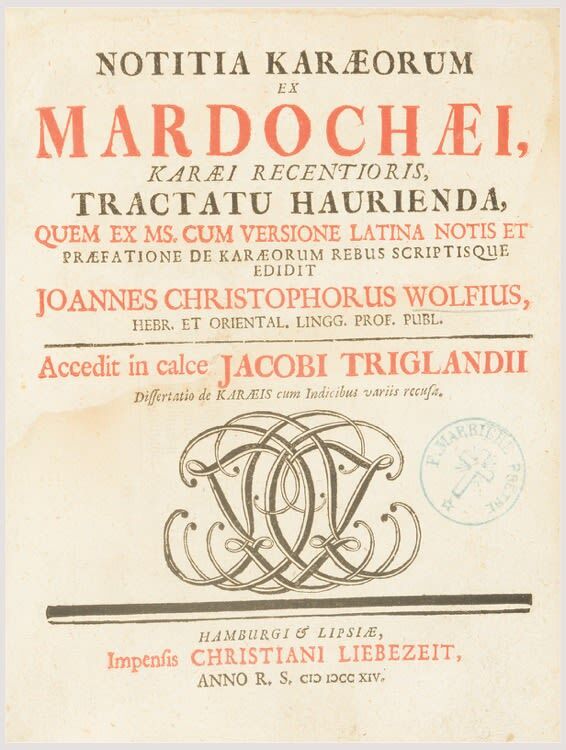 The second part of this volume consists of Trigland’s original treatise: Diatribe de Secta Karaeorum (pp. 161-317).